We decided we wanted to head straight to the south end of the bluff to look for the milkweed. We cut up around the side where we were able to climb up the small but steep rocky slope along the south edge. This brought us up on the bluff a little way down from the top but not too far from where I’d placed a cairn last year by a dead plant with seed capsules. John located the cairn fairly quickly. We found the large plant next to it and four more plants coming up nearby, two of which were pretty small. I was glad to confirm they really were milkweed plants, but it was rather disappointing that the population was so small. We wandered around separately looking for more and then gave up and started to head down the ridge, intending on looping around to the creek and back up on the north side—the same way John and I did the last trip. But I had this nagging feeling that I’d missed some up higher, so I climbed back up to the top. There was a milkweed, and another, and another! Right by the edge of the forest, there was a small area with at least a dozen plants. As I walked over a bit to the north, I ran into Sheila. She also had the same idea that we hadn’t been very thorough and had found another dozen or so plants. Since John was way down at the bottom at this point, we decided we’d better come back here at the end of our loop and do a more careful survey. Marshall’s saxifrage. 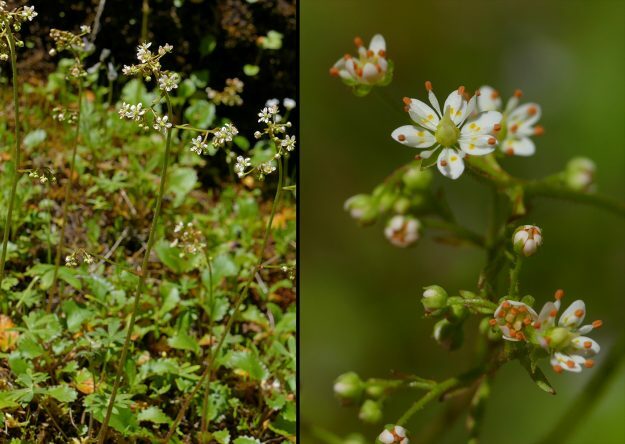 The bright yellow spots on the petals and the long-petioled, toothed leaves help distinguish it from similar species. Sheila and I headed down the steep hill, enjoying the gorgeous larkspur (Delphinium menziesii) and California mistmaiden (Romanzoffia californica) that were plentiful in the shadier areas near the forest along the bottom. There was also common monkeyflower (formerly Mimulus guttatus, now Erythranthe ??) and Hall’s lomatium (Lomatium hallii) in full bloom. We eventually caught up with John down by the edge of Coal Creek. It was just as beautiful as we had imagined it would be when we were down there in March before much of anything was in bloom. There were lots more monkeyflowers, larkspur, and mistmaidens, and we also found three species of blue-eyed Mary getting started (Collinsia rattanii, C. grandiflora, C. parviflora), tons of the tiny baby innocence (Tonella tenella), and Merten’s saxifrage (Saxifraga mertensiana). And, what we had really hoped to see, our mystery saxifrage was at long last just starting to bloom. John had brought a description of the possible species. We had been thinking it would probably turn out to be Marshall’s saxifrage (Micranthes marshallii), so we checked for spots on the petals. With the naked eye they were difficult to see, but with a hand lens, the bright yellow spots on the petals were quite obvious—our ID was correct! 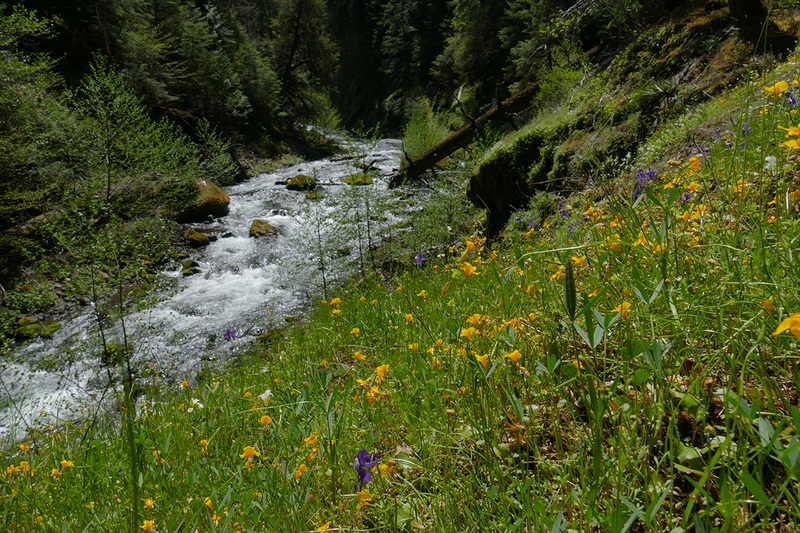 A view of Coal Creek from the flowery banks above. It was hard to stop looking at and photographing plants, but I was pretty hungry. We sat down on the mossy rocks in one of the few places where they weren’t densely covered with flowers. 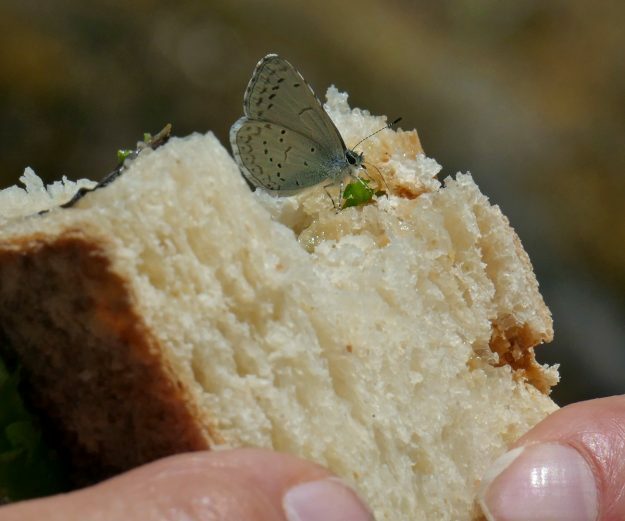 We were quickly joined by several little echo azures (Celastrina echo) who were intent on sharing our lunch. Sheila generously allowed two to sit side by side on her finger while she ate her sandwich with the other hand. 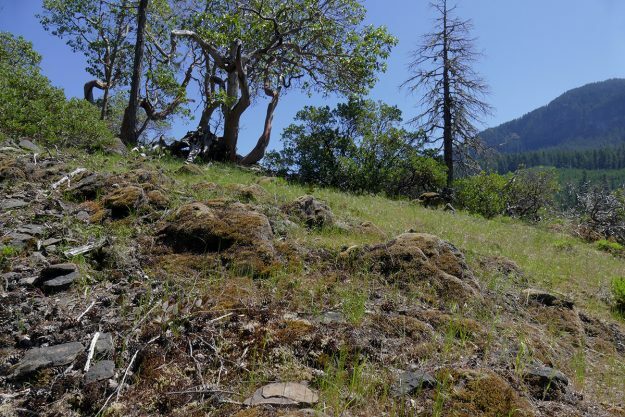 A California tortoiseshell flew by a number of times, and a pair of elfins—possibly Moss’s—were courting in the air (actually it seemed like the female was trying to get away from the persistent male, #metoo!). We also watched many small bees nectaring on the plentiful flowers. Thankfully, no ticks showed up for the party! This little azure decided Sheila’s lunch looked particularly appealing, while another helped itself out to my sandwich. 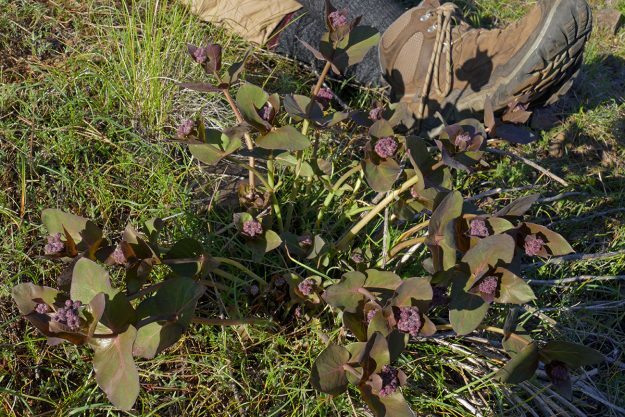 While the cotyledon leaves of showy milkweed (A. speciosa) are sessile, seedlings of purple milkweed have petioles as long as their leaves. They are also rounder. Eventually, we left this lovely spot and headed up the north edge. I was able to collect a lot of seed of gold stars (Crocidium multicaule), which were still blooming over 5 weeks after we’d seen them covering this same slope but starting to go over. John found a really large elk antler, which he carried for a while, but it was quite heavy so he eventually left it to mark our milkweed population. We added more plant species to the list, including mission bells (Fritillaria affinis), in early bud near the top. Before heading out, we went back to the corner where Sheila and I had found more milkweed. Maybe it was fresh eyes or an extra set, but it seemed like there were more in the same area than we had seen a few hours before. We tried to count them all, and although we lost track, we’re pretty sure there were around 50. They ranged all the way from large plants with about a dozen stalks to a fresh seedling with only its two cotyledon leaves. The only reason I recognized it is because I’m trying to grow some from seed I collected at Monarch Meadow last year, and the first two just germinated this last week. 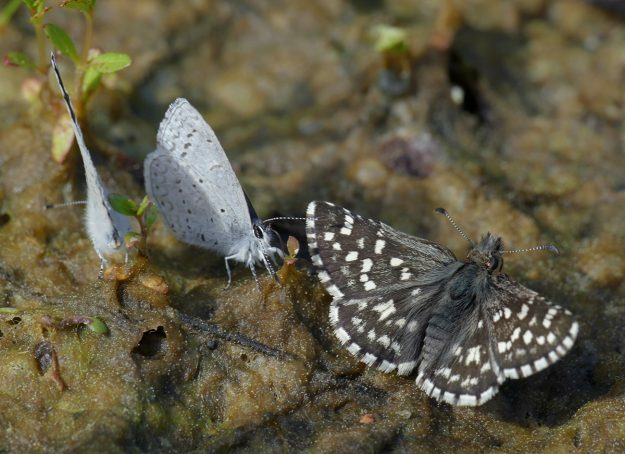 A two-banded checkered skipper was among a large number of echo azures puddling in the mud along the road near where we parked. Since none of us were in a rush to end our wonderful day, I suggested we climb up the slope at Big Pine Opening. It is opposite the beginning of Coal Creek Road, so not out of the way at all. Sheila had never been up there to see the population of purple milkweed at the top. This was the first spot someone brought me to see it many years ago. I figured it would be a very short visit, but it was so lovely at the end of the day with a pleasant breeze that we were there for quite some time. We found some plants I didn’t know grew up there, including the uncommon western rayless fleabane (Erigeron inornatus) that I kept finding last year in many of the other purple milkweed sites. We also saw a couple of checkerspot caterpillars munching on rough-leaved aster (Eurybia radulina), my first of the season. Then we went around looking at all the milkweed. I was impressed with how much they had grown in only five days. There were many very large plants in the area. Finally, we settled down in front of what we thought must be the prize winner—I counted 40 stalks! Our prize-winning milkweed had about 40 stalks, some still just pushing up out of the ground. It ought to be magnificent when it is in full bloom! We spent a long time studying this magnificent plant. Usually, I’m too busy running around looking at everything to really sit still and look carefully at one plant. The amazing thing is how their flower heads are already formed, even on the newest shoots only an inch out of the ground. This is not true of our other Oregon Asclepias species. We theorized that in their well-drained, rocky environment, it might be beneficial for them to bloom quickly after their late emergence before the ground dries up too much. We also noticed a few tiny purple buds in some of the leaf axils. Sheila guessed correctly that those would become flowers as well, something I confirmed when I looked at my photos of blooming plants from last year. These lateral clusters are much smaller than the ones at the top and probably only occur on robust plants like this one. 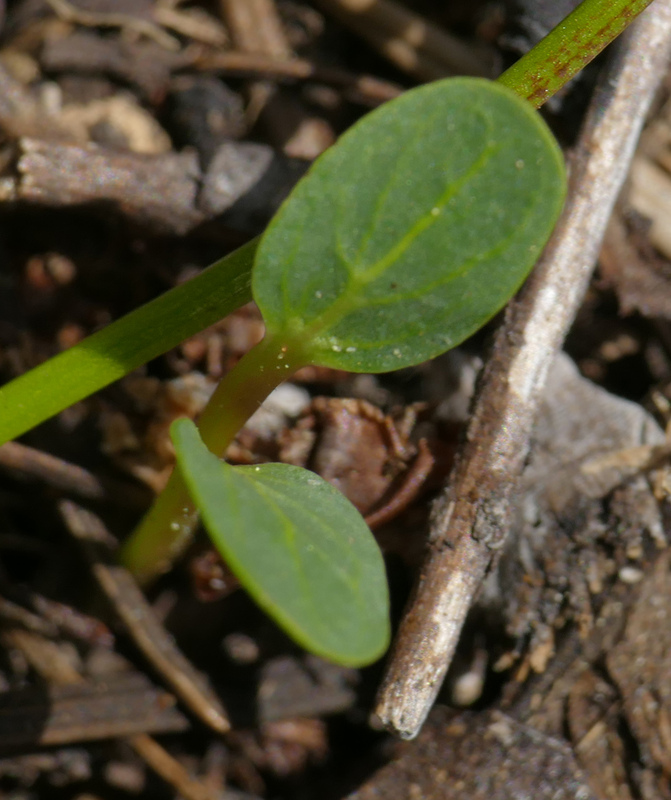 There were also a couple of pairs of smaller leaves at the bottoms of the stems. They seemed to be turning yellow already, even though the stalks had probably been up for a mere week. Perhaps they protect the shoot as it emerges and then they are no longer needed. So many questions! Unlike last year when I didn’t see the purple milkweed until late June, this year I’m looking forward to studying this gorgeous species throughout its whole life cycle. How exciting. What an impressive plant. I really hope you’ll get photos of it when it blooms. And congrats on germinating your collected seeds. Fingers crossed that they do well for you. Keep us posted.